A specially designed double sided foot pedal will make getting through the gate easy for those busy moments when your hands are occupied. The foot pedal is strong enough so that pets cannot put enough pressure to open the gate. 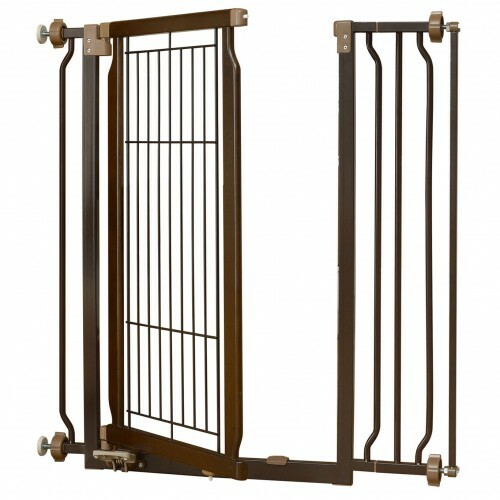 Great for small to large dogs, the pet gate has an upper and lower locking system that opens in both directions. You can now move in an out freely, while keeping your pet confined to its special area. As an option, gate can also be opened using one hand. Quality testing determined dogs up to 90 lbs. cannot provide enough pressure to open the door using the foot pedal. Adjuster knob attaches gate to doorway/hallway opening using tension-mount installation. Rubber stoppers protect wall surfaces. Recommended for small to large dogs 8.8 to 88 lbs. Instruction manual included. Made from Rubberwood.